Liberia’s Ambassador designate to the Kingdom of Belgium, the Netherlands, Luxemburg and the European Union, Amb. 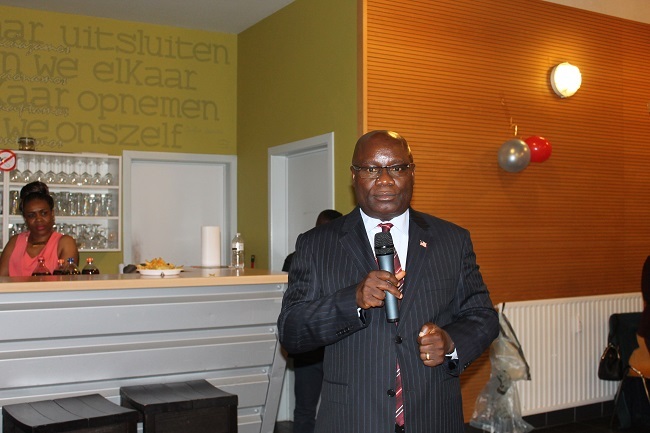 Isaac W. Nyenabo, II has challenged Liberians in the diaspsora, especially those in the Benelux Zone to join the massive development and reconstruction taking place in their country. Ambassador Nyenabo told a group of members of the Liberian community residing in the region who had gathered recently to welcome him as their ambassador, that since the election of President Ellen Johnson-Sirleaf, the country has transformed in many areas, thus promoting development and boosting infrastructure in the country. Ambassador Nyenabo said since 2005, the country has seen massive improvements and huge development in the areas of roads reconstruction ( both rural and urban roads), the construction of new schools and the rehabilitation of old ones across the country, the construction of health centers and hospitals in nearly all parts of the country and massive housing development in both the private and public sectors. The Liberian diplomat named the Monrovia-Buchanan Road, the 72nd Road, the Monrovia-Ganta Road, the entire Central Monrovia Road Project, the Gardnerville Road, the Neezoe Road and many neighborhood roads plus other rural roads that have been reconditioned or are to soon get constructed as just a few to consider. He said the old Waterside Bridge, the Caldwell Bridge and many bridges have either been reconditioned or reconstructed across the country. ”As I speak to you fellow Liberians, there are many junior colleges across the country in Grand Bassa,Lofa, Bong, Nimba, Sinji Technical School and other colleges have been established to cater for rural people. Also remarkable, is the transformation of the William VS Tubman Technical College which was a junior college now to a full fledged University program that grants degrees in many other disciplines to Liberians in the southeast and other parts of the country” he added amidst cheers from the audience. Ambassador Nyenabo decried the devastation of the country’s health and economy sectors as a result of the outbreak of the Ebola Virus Disease, which, he said reversed the gains made over the past years, but quickly added that a serious reform program has been put together to address post -ebola recovery of the country and called on Liberians in the diaspora to join those efforts aimed at addressing the reconstruction of their country in a massive way. 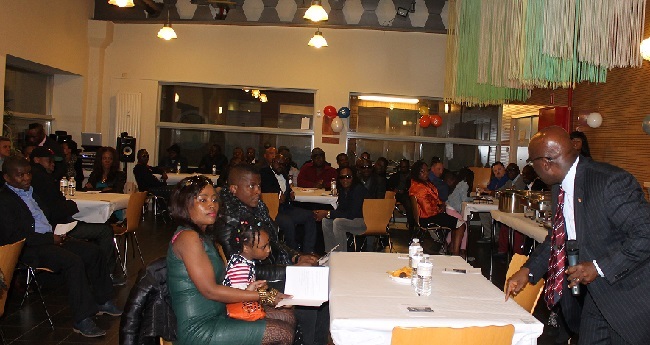 He called on Liberians in the Benelux to be good ambassadors of their country and people by remaining law abiding and taking advantage of the many opportunities available to them by their host countries, as Liberia will one day need their expertise and professional skills. The president of the United Liberians Association in Belgium Kingston Wleh, who hosted the program, welcomed Ambassador Nyenabo on behalf of his colleagues and pledged their unflinching support and cooperation in working with him as their Chief of Mission and their country’s representative to the Benelux countries.